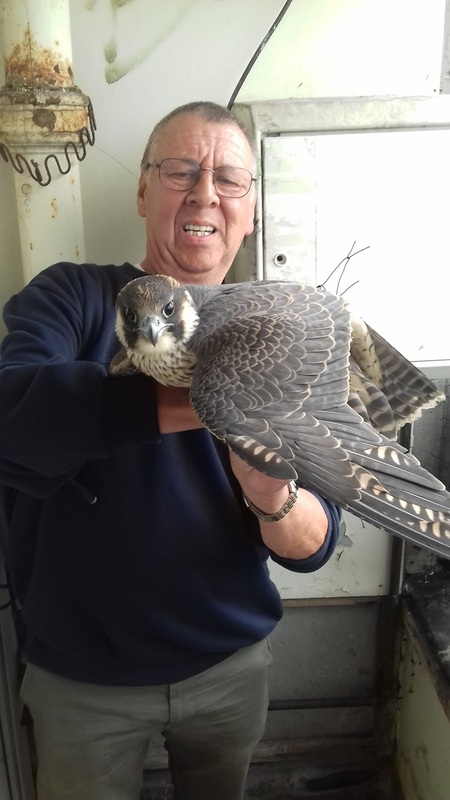 I received a call along with Stuart from the LPP on Saturday in regards to a trapped juvenile peregrine in London, which at the time was thought to be trapped behind netting and not in it. Peregrines, especially inexperienced juveniles and the fine gauge pigeon netting do not mix and where possible, on the sites that I monitor, I try to get it removed. From past observations it can be deadly to them. 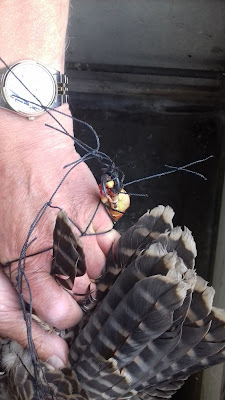 In this case I was hopeful as we thought it would be a straightforward catch and release after removing the netting altogether, sadly this was not the case. On arrival in the afternoon, the juvenile, a female, was hopelessly entwined in the netting and had obviously on occasion during the day, been hanging by one leg, it was apparent straight away that this leg had sustained damage. As we cut her out I noticed the twine netting had completely gone round the foot, 2 talons had been ripped out completely, she must have been in agony. The circulation to the foot was cut off and there were further wounds up the leg as she no doubt tried to escape whilst hanging. 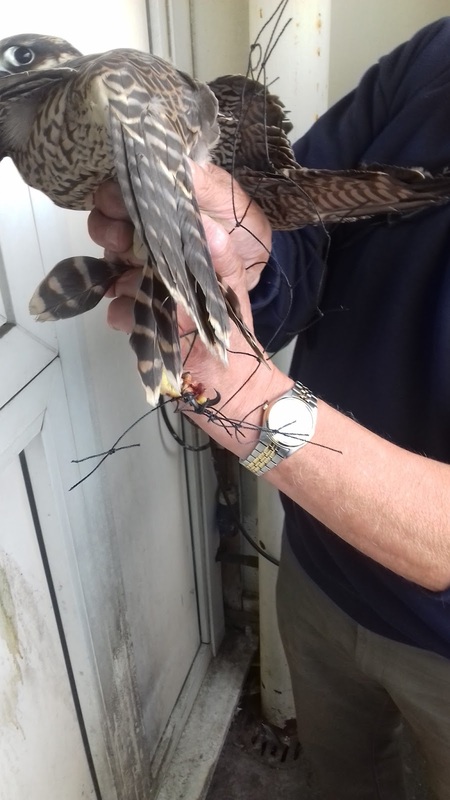 We eventually removed it all, a very big thanks to John for helping me; the twine was all over her leg and parts of her body, he had to be very careful cutting whilst I held her. 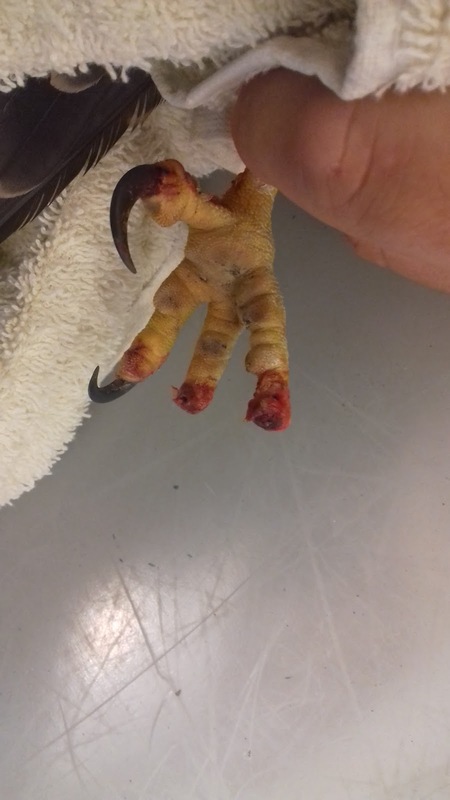 I then took her down to the Wildlife Hospital, she was x rayed and it was found that there was further extensive damage to the whole of the leg, every joint, reluctantly they had to put her to sleep. 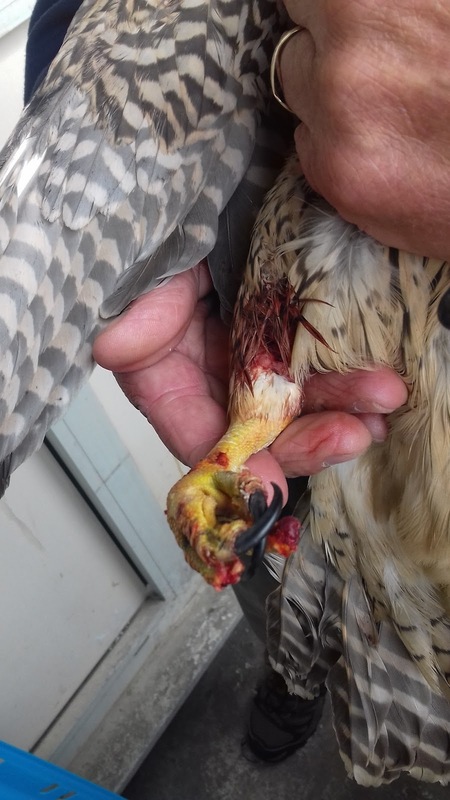 A very sad case and an end to a magnificent bird which highlights just one the hazards that they face on fledging in the City, but also brings home the issue of low guage pigeon netting on peregrine sites, it is a major major hazard and an accident waiting to happen I’m afraid. 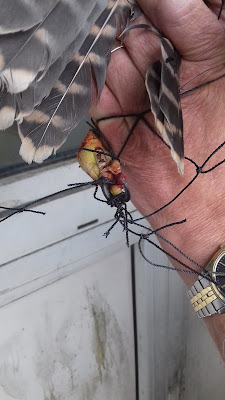 Basically it should not be present at any breeding peregrine nest site aloft in their environment,especially loose netting, in low light/nocturnal flying it is a massive danger, even with their eyesight. 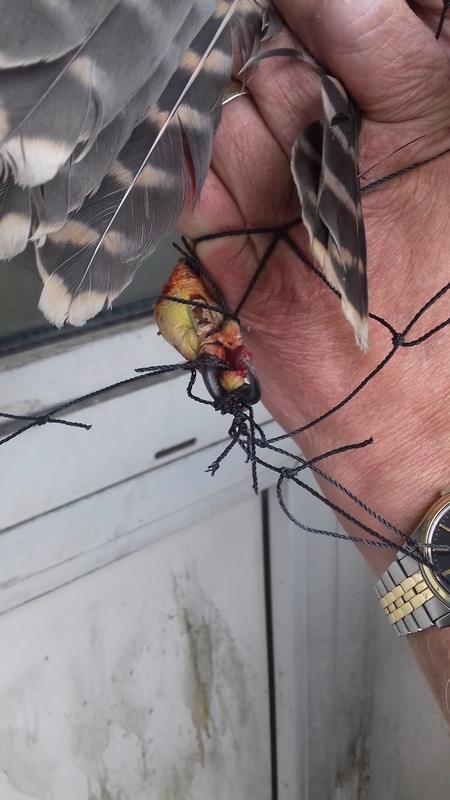 Juveniles are most at risk as they simply don’t realise the danger it poses, sadly this bird found out the hard way. Below are some photos following on from the June 24th posting, it relates to the same family of 2 'chicks', as you can now see more or less fully grown and now juveniles. The area that they frequent is a flooded area unfortunately also favourited by large Gulls, these or Crows could be what accounted for the other 2 chicks,additionally there is a resident Kestrel. 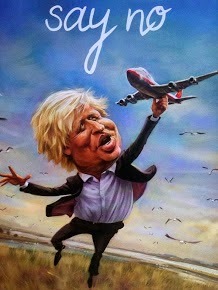 However they have done well and good to see that both juveniles are now at the flying stage. 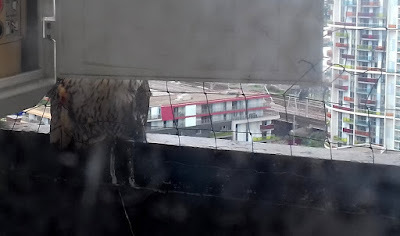 Recently, with many juveniles fledging, I have observed a number of nest sites as you would expect at fledging, one of which is a site I watch extensively – Battersea Power Station. This pair has again been successful this year with 4 juveniles fledged in their purpose built Tower, since its installation in 2013 it has now produced 15 juveniles. Watching the fledged juveniles earlier on June 23rd showed some odd behaviour by the adult Falcon concerning one of the juveniles. Whilst looking for the adult Falcon from one of the roofs, I caught sight of her approaching the Power Station with prey, a little way out she was intercepted by a juvenile and an aerial food pass took place. The juvenile then landed on a wall 30 metres up with the adult Falcon landing on one of the nearby Cranes just above the juvenile, the juvenile then proceeded to feed in view of the Falcon. Shortly after this the juvenile was then found by 4 Crows, a pair with 2 juvenile full sized Crows in attendance, they then proceeded to mob the juvenile, as I watched, thoughts were this is going to be interesting as the adult Falcon will not tolerate this. However, I couldn’t have been more wrong, she totally ignored the mobbing, she was watching it as it was in full view of her perhaps 25 metres away, even without hearing the juvenile’s chek-cheking in agitation. This went on for quite a while, the juvenile held its own but eventually flew, the Crows stayed inside the Power Station. The Crows had bred inside the Power Station which made them territorial also; it could be that the Crows were defending territory/juveniles even though out of the nest. Crows being Crows though will always mob however given the chance, especially a juvenile. It’s also possible they were after snatching the prey. A similar scenario happened on June 16th, a juvenile was found by 3 Crows and relentlessly mobbed by them, it flew and was then pursued to another section of the Power Station, all this in full view of the adult Falcon sitting on the Tower. Knowing how aggressive any territorial pair of peregrines can be towards Carrion Crows, Herring, Great and Lesser Black Backed Gulls, larger birds of prey along with Grey Herons, I found the behaviour hard to understand given their normal hostility towards Carrion Crows specifically. Having watched this pair for a number of years, Crow attacks/mobbing increase greatly going into breeding, much the same as other pairs, only 3 years ago; one of the adults knocked a Crow down at Battersea breaking the wing of the bird which then had to be euthanized. I can only presume that the adult ignored the juvenile’s plight on both occasions as she may have been teaching it a ‘life lesson’, like you’ve fledged and your big enough now, this is life deal with it. A hard harsh lesson, if it was one, the juveniles have only just fledged so the bond is still very strong, unusual behaviour or just indifferent parenting?